Vauxhall Insignia gets new safety system | What Car? Vauxhall's forthcoming Insignia family car will be the first of the company's cars to benefit from an all-new safety system that reads road signs and warns drivers when they veer out of their lane. The system is known as the Front Camera System. It uses a wide-angle, high-resolution camera located between the rear-view mirror and the windscreen that takes 30 pictures a second, and two signal processors filter to 'read' the photos. One processor identifies the information on road signs - so if it detects a speed limit sign, for example, it will display the limit on the instrument panel. 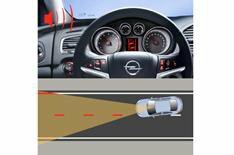 When the Lane Departure Warning function is switched on, the other sensor reads the lanes and records the driver's normal lane-changing behaviour, taking into account steering input and indicator use. If it detects that the driver deviates from his normal behaviour, an audible and visual warning is sent from the instrument panel, which Vauxhall says could help prevent dangerous situations such as the driver falling asleep. The Front Camera System will be available as an option on the Insignia when it goes on sale in October, but Vauxhall says it will be available on other models in future.